... If anyone has any data on how multipliers increase or decrease, I'd appreciate actual numbers. 現在プロデュース中の楽曲（がっきょく）である - The song you're currently producing. Yeah I know, but why is there another clause under the 'Break' conditions that read something like "The song must be your latest release"? Doesn't "the song you're currently producing" and "the song must be your latest release" mean the same thing? Or are there circumstances where the song you're currently producing is NOT your latest release, and vice versa? Ah, okay. I was taking those points as separate things. I haven't exactly tried out the Break and Revival stuff yet, but when you decide to produce a new song, there is a 4 week period after you choose your new song until it actually starts selling. So week 2 after you've decided to produce Shiny Smile, your latest release would still be the song that you produced before that. If you understand what I'm saying. Also, before a performance I've seen it ask me if I want to change the song. I've never tried it, but I assume it might change the song you are producing back to one of the other ones you have. Yep, I understand what you're saying perfectly. This is as opposed to your latest release being the new song you've just announced (but is not on sale yet), right? From an English-speaking perspective that would make the most sense. A song cannot be "the latest release" until it's actually released to the market. But I don't know how it is in Japanese. It's possible that "saishin release" might be whatever new single you've just announced, but doesn't go on sale until four weeks later. After all, they used a foreign word ("release" in Katagana) instead of Kanji. Their understanding of the foreign word "release" may be different from ours, and it may not carry the same connotation that something must first be released before you can call it a release, in the same way they use the word "information" different from us English natives (they use the word "information" the same way we'd use the word "announcement"). Long story short: can someone please test this thing out, please? You want me to attempt a 'Break'? or a 'Revival'? I'll do it since I'm still on my first single. On another note, RK is owning the crap out of my precious 'Firefly' unit. Like 30000+ owning, is the Fes at Week 10 supposed to be a losing battle? Also, could someone tell me what the symbols in the Unit mood thing in the upper right of the screen mean exactly? And how to err, fix them? I'd really appreciate that, thanks. I'm 99% sure that the first FES against RK is supposed to be a loss. The symbols in the upper right of the screen should be on page 17 of the manual. And the producer generally says what the problem is. I'd also really appreciate some info about that. Thanks everyone with all the other information so far. It's really great! 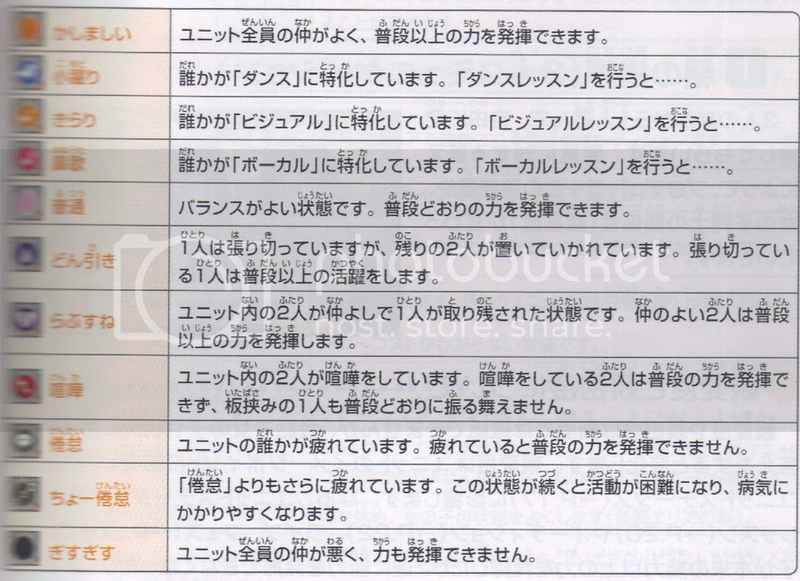 The text in the scan is too small for me to read them properly, so I don't know exactly what you have to do. But generally there are symbols that tell you stuff like, your unit's in the mood to do Da/Vo/Vi lessons. Or if two of them are doing good and one of them not so good, etc. At the end of each week, you are given the option to talk to your team. If they are having problems, the Producer will address that, and you'll be given a dialogue option to try to make them better. Fan letters also help, and the morning greeting I believe too. Unfortunately even though the text is super clear now, I still can't quite make heads or tails with what you're supposed to do with them... can someone else please shed light and translate this part? They used quite a number of kanji that I'm not too familiar with (will have to look it up), and even then, without having played the game I wouldn't know if my interpretation is accurate or not. kashimashii - Everyone in the unit gets along well. Everyone will perform better than usual. Normal - A well-balanced team. Everyone will perform normally. Turn off - Someone's in high spirits, leaving the other 2 behind. The energetic one will be focussed on. rabusune - Two members in the unit get along well, leaving the remaining idol out. The 2 will perform better than usual. Quarrel - 2 people in the unit are having a fight and wont perform well, the other member won't behave like usual either. Extreme fatique - Worse than fatique, something bad might happen if you continue like this. Strained atmosphere - All members in the unit don't get along at all and won't perform well either. You guys were right. Actually when Boss Takagi (or was it Kotori? Can't remember) first explains to you the mechanics of announcing and releasing a new single, he/she mentions that from your second song onwards, at any point in time if you choose to do a previous song at a Live/Fes/Audition, then that song becomes the one you're currently producing. However, if you choose an old song during an encore/quintet live, it doesn't count. Thanks dude, it's a very handy list to refer to. I still haven't got to the part where I have to start managing the unit's mood status yet, but I tell ya it's gonna be soooo confusing. This'll help.